Imagine eating the most regional dish in its exact place of origin, overlooking the bay and the fields which yielded the produce. 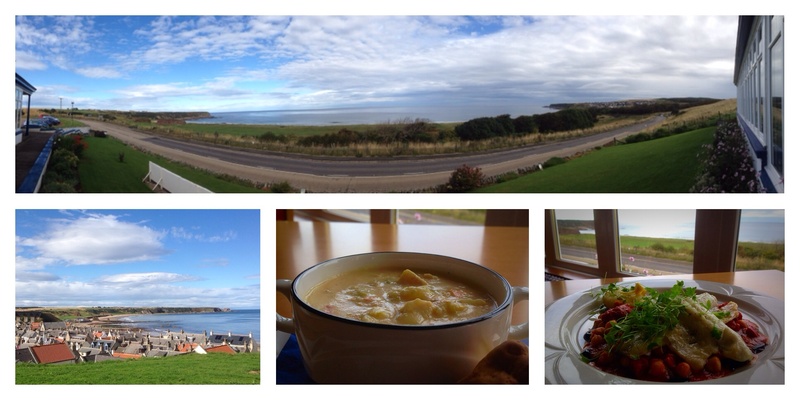 That’s my experience at the aptly named Cullen Bay Hotel in the North East of Scotland. This is the home of the famous Cullen skink, a kind of smoked fish chowder. Even better, I am eating (drinking is hardly an appropriate word for the consumption of this viscous deliciousness) skink with a twist, winner of the national Cullen skink championship. The twist is the saucy addition of sweet potato, chilli, molasses and brandy. Nae bad for a lunch snack, followed by sea bream. Yes, I am eating fish. See also Deveronvale is not McLaren Vale and Pheasant food. Your title caught my attention. I didn’t think they had Skink in Oz and in fact it turns out that you are back in Bonnie Scotland. I love Cullen Skink. We are not quite in Cullen, but you get it a further south too. It is the most delicious soup, that is if you like smoked fish. I like the sound of your variation too. Yes back for a visit and maxing out on Scottish cuisine!